942617649 -This clearly written, award-winning book about economics is a remarkably easy and fun explanation of money (its origin and history), the dollar (its origin and history), investment cycles, velocity, business cycles, recessions, inflation, the demand for money, government (its economic behavior), and more. All explanations and interpretations are according to the Austrian and Monetarist schools of economic theory. Whatever Happened to Penny Candy? is essential for every student, businessperson and investor. It was recommended by the late William Simon, former U.S. Treasury Secretary and is also on many recommended reading lists. Whatever Happened to Penny Candy?” can be used for courses in economics, business, finance, government and Ancient Rome. 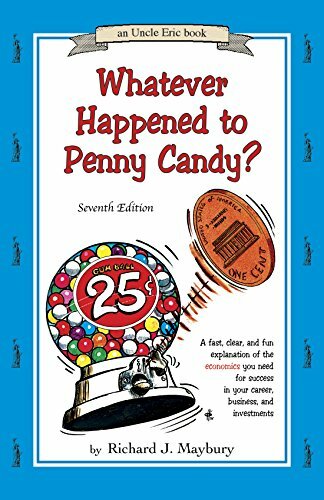 To improve the student’s learning experience, also purchase the student study guide for “Whatever Happened to Penny Candy?” titled “A Bluestocking Guide: Economics” also available through Amazon. 12. What’s So Bad About the Federal Debt?